The second volume of this series of video tutorials is dedicated to Seascape or Landscape Images. I will teach you throughout 6 videos my overall Editing with a comprehensive step by step guide from beginning to the end. This tutorial is useful for any beginner in lightroom (Lr) and photoshop (PS) as well as if you have a basic or advanced working knowledge of Lr and PS. 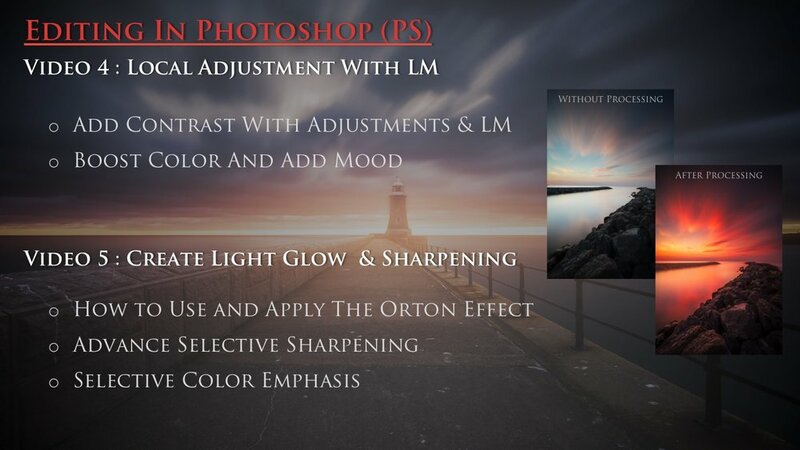 It is nevertheless recommended to have already some basic knowledge in layer mask in PS. Total running time of the 6 videos is 1h36min. All the videos are mp4 format and 1080p resolution. Speaking language is ENGLISH only. Download link will not be shared automatically right after payment, but within the next 24h00 after ordered. The download link to the video tutorials lasts maximum 1 Week upon email notification and will be deleted in the next 24h after the download. The overall content of the tutorial is described here below. We will cover in this volume 2 some great technics to completely change the mood of your image to achieve a dreamy look. To do so, I will teach how to create luminosity mask handy and then how to record actions to speed up your processing workflow. Then, I will demonstrate the huge benefit of luminosity mask to create contrast, texture, color boost within adjustment layers in PS. Finally, I will show you how to create glowing light and sharpen your image to emphase the dreamy look. The last parcel of this processing video will teach you how to correct perspectives and remove any distracting element on your image.